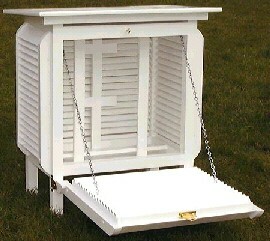 A Stevenson Screen is a white boxed shelter that contains temperature and relative humidity equipment. It shields the instruments from sunshine and precipitations and has louvered sides to permit the free movement of air. The shelter is placed over grass, mounted 1 meter above the ground and as far from buildings as circumstances permit. Climate refers to the average weather conditions at a specific place over a lengthy period of time (more than 30 years). The climate of a region plays a role in determining what agricultural crops can be grown in that region. The World Meteorological Organization, an agency of the United Nations, is responsible for the international exchange of weather data. It certifies that the data observation procedures do not vary among the over 130-nation participants. Temperature refers to how hot or cold the atmosphere is as measured by a thermometer (in Celsius (C) or Fahrenheit (F), or Kelvin (K) ). A traditional thermometer consists of mercury, red spirit or green spirit in a glass tube and operates on the principle that the liquid expands more that the glass does when heated. Digital electronic devices can also be used were the unit can record the max and min temperature reached and some units can store a series of data (a data logger) and others transmit an electronic signal measuring temperature back to a second temperature display on a PC or a base. These new probes can also be used to measure soil temperature. Atmospheric Pressure - the weight of the atmosphere overhead (the force exerted on a unit area, such as a square centimeter, by the mass of the atmosphere as gravity pulls it to earth) - expressed in millibars of inches of mercury. Commonly measured with a mercury barometer, a glass tube in which the height of a column of mercury fluctuates as the weight of the atmosphere changes. Changes in atmospheric pressure signal shifts in the weather and can be measured with a simple dial barometer. Humidity refers to the amount of water vapour the air contains. (Expressed as relative humidity, or the amount of water vapour air contains expressed as a percentage of the maximum amount it can hold at the same temperature). Cool air holds less water than warm air. Measuring Humidity; A Psychrometer is an instrument used to measure relative humidity. It traditionally consists of two thermometers, one covered with a wet cloth. Evaporation cools this thermometer below the actual air temperature, recorded on the dry thermometer. Evaporation and cooling depends on how dry the air is at a given temperature. A table can be used to determine the relative humidity from the amount of cooling. Digital electronic instruments (hygrometers) can be used for quick readings and more upmarket units offer data logging. Some instruments offer a simple dial readying of Relative Humidity, while these offer the least accuracy they can be used as a good indication. Growing Degree Day (or Heat Units) - a measure of the departure of the mean daily temperature above or below a given standard. Information can be used to optimize timing of planting, fertilizing, pesticide application and harvesting. Growing Season - the period of the year when crops and other plants grow successfully. Calculated by the average number of days between the last heavy frost in spring and the first severe frost in autumn. The length of the growing season varies from place to place and partially determines what crops can be grown in an area. Precipitation is a term that covers all of the forms in which water falls to earth from the atmosphere. Main types: rain, snow, sleet and hail. Precipitation is life-sustaining - its amount and distribution a regions receives plays a major role in determining what can survive there and what plants can be grown. A tipping bucket is an instrument used to measure precipitation. It contains a dual-chamber mini-collection bucket located beneath a collection funnel. When precipitation fills one side of the bucket, gravity empties it and sends a signal to the data logger. Some tipping buckets are equipped with internal heaters to melt snow and frozen rain. Simple rain gauges. Basically, any measuring glass left outside can serve as a rain gauge. However, since most rain showers are usually quite windy, you'll want to fasten your rain gauge somewhere so that it doesn't blow over. Locate a good place for your gauge. There should be nothing overhead, like trees, electric wires, or the edge of a roof. These obstructions can direct rainwater into or away from your gauge, creating a false reading. The edge of a fence, away from the building, is often a good place for your gauge. Tip: A ring of slated metal around the perimeter of the rain gauge provides a wind shield to decrease splash and wind-induced errors. Once you have found the spot, attach a holding rack. Then, slip your measuring glass into position. Wait for rain, then record your measurement, and empty the glass. Rain refers to liquid precipitation that falls from clouds as drop 0.5 millimeters in diameter or larger. Drizzle consists of drops smaller than 0.5mm. Hail originates when colliding drops of water freeze together in the cold upper regions of a thunderstorm. Hail can cause considerable damage to agricultural regions, depending on the size and intensity of the hail storm. At 12:15, May 30, 1985 45 cm of hail fell in the Leamington area causing damage to plants and greenhouses. Drought refers to a prolonged period of greatly reduced precipitation. Droughts can last a few weeks (in which case they are called dry spells) or months, or even years.